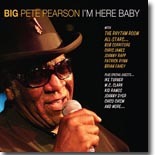 Arizona's King of the Blues, Big Pete Pearson, scores big with the first nationally-released CD in his long career. It's featured in our Pick Hit section. Chicago singer Katherine Davis's latest CD, Rock This House - Live, shows with this month's Surprise CD that she truly can "rock the house." Luther Allison made his triumphant return to the U.S. blues scene a dozen years ago with the groundbreaking disc, Soul Fix' Man. It's in this month's Flashback section. This month's What's New features new releases from the The Groanbox Boys, Tracy Conover, Michael Powers, the gonstermachers, Barrelhouse Chuck, Danny Brooks, and JW-Jones Blues Band, plus a DVD from Chicago Blues Reunion.